LAKE CHARLES -- Over the past week, Congressmen Clay Higgins and Ralph Abraham who both represent the Louisiana rice producing region, took the opportunity to see firsthand the results of recent rice sales to Iraq. 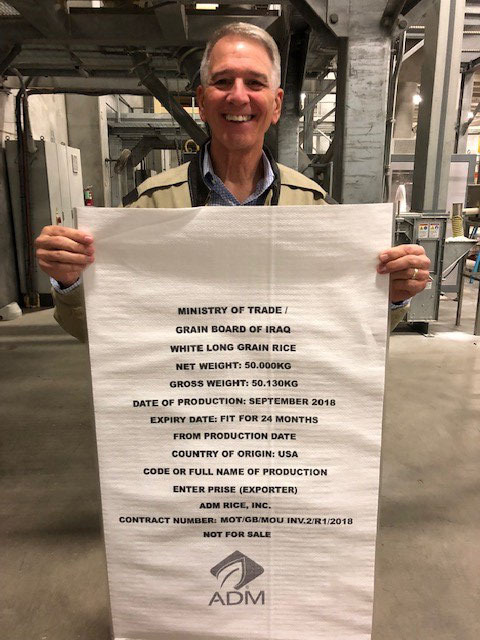 "Congressmen Abraham, Higgins, and several of their colleagues made supporting the sale of U.S. rice to Iraq a priority, and what better way to say 'thank you' than to come and see the results for yourself," said Nick Bernhard, CEO of Farmers Rice Milling Company. During separate visits to the Port of Lake Charles, Port Director Bill Rase thanked both Congressmen for their commitment in making this sale a reality. "These shipments mean a lot to the Port of Lake Charles," said Rase. "These four cargos equate to a value of $17 million per cargo, and employ more than 90 longshoremen, working a combined 78,000 man-hours, to load these four vessels." Todd Henderson, director of port operations, said, "This is the kind of cargo going through the port that we love to see. It means jobs and benefits, and that's good for the economy all around." Bernhard and Phillip Bertrand, also with Farmers Rice Milling Company, Robert Bond, COO of the Powell Group, and rice farmer and NELA Rice Growers Association President Scott Franklin met Abraham and staffers from both offices at the Farmers Rice Mill facility, where a portion of the rice sold on the first vessel bound for Iraq is being packaged. The legislators were briefed on the many moving parts involved in getting this rice to the vessel and the several local companies that played a role in the process. The enormity of the economic impact was obvious when Abraham and Higgins each entered the multiple warehouses, stocked with pallets of rice from one end to the other, and were told this was only enough rice to fill the first vessel. Abraham, surrounded by stacks of rice poised for loading, said, "This is what makes it all worthwhile. What a great day for rice!" Upon entering the first warehouse, Higgins said, "What a beautiful sight! You realize just how much of an impact this has on the industry when you see it in person. All this rice came from Farmers Rice Mill, Supreme Rice Mill, and Beaumont Rice Mill, proving that when we work together, good things will happen." Bond said, "The economic benefits start locally with the growers and the mills producing and providing a high quality product, then it continues with the purchase of bags to package the rice, hiring trucking to deliver it to the port, and labor to load the vessel. That's money that gets reinvested back into the local economy."